[0:41] <malinus> Hello I have the wireless dong: "050d:705c Belkin Components F5D7050 Wireless G Adapter v4000 [Zydas ZD1211B]". The package with the frimware/drivers is both in the non-free wheezy, squeezy and jessie repoes. But I'm not sure how to proceed from now. Which of these repoes should I add to get the package on my raspi, and be sure it works? [0:49] <malinus> ShorTie, "usb 1-1.2: Could not load firmware file zd1211/zd1211b_ub. Error number -2"
[0:49] <malinus> annd " zd1211rw 1-1.2:1.0: couldn't load firmware. Error number -2"
[0:52] <mantazer> if im using my pi as a web server, what ports do i need to forward other than 80 and a ssh port? [0:54] <malinus> so yeah, I need the firmware, and I know that the non-free wheezy, squeezy and jessie has them. I'm just not sure how to get them for the raspi debian version correctly. [0:56] <atouk> are you going to serve the page on the WAN, or just the LAN? [1:00] <mantazer> isnt apache a bit heavy? [1:02] <mantazer> i know that its better to change your ssh port to something other than 22, but should we really be changing the ssh port to another port that could be "reserved" for something elsE? [1:13] <The_HunterT> Apache is a bit heavy, nginx is what I use on my Pi. [1:15] <mantazer> The_HunterT: do you use any frameworks? [1:15] <The_HunterT> For code or nginx? [1:49] <tom-x> anyone used the Banana Pi? [1:51] <Geo> Hi, is there any reason a Pi could not pass Dolby 5.1 via HDMI? [1:51] <Geo> or rather, should it be able to pass 5.1 via the HDMI output? [1:52] <CaNsA> whats the pi hooked into? [1:53] <CaNsA> the a/v receiver has the skills to decode the sound you are sending to it? [1:54] <CaNsA> you have enabled passthrough on the pi? [1:56] <Geo> good to know. [2:24] <orst3n> hi, is it possible that lan wont work properly with cheap sd cards ? [2:25] <orst3n> bought a pi starterkit with a 8gb (4) sd card wich worked fine, now im trying to use my 32gb (10)sd card (hama) and i just got troubles..
[2:28] <The_HunterT> What do you mean LAN? [2:31] <The_HunterT> 74% of what? [2:31] <orst3n> percent of downloading the openelec image trough the noobs image..
[2:32] <orst3n> 1st ive installed openelec directly trough my notebook but i wasnt able to get a wired connection with it..
[2:36] <abnormal> ChanServ, are u the same one in linux mint channel?? [2:36] <orst3n> lol, its a bot..
[2:38] <abnormal> orst3n, what is it suppose to be? [2:38] <ShorTie> it gives you power, lol. [2:43] <orst3n> looks like my class 10 32gb card is more trash compared to the 8gb class 4 card i got from rasberry..
[2:43] <atouk> do you have a free usb? [2:47] <abnormal> why so many log in then log off imediately after?? [2:53] <abnormal> I tried using WiPi dongles but they died on me, so I got Ourlink ones, not the small ones, but the ones the size of thumbdrives. [2:56] <abnormal> what's wrong with the wiring? [3:14] <abnormal> All I know is how to turn on and off computers!!! [3:16] <abnormal> yeh, by the way do some powered usb hubs fail??? [3:17] <Matt> with the pi specifically, or just in general? [3:17] <abnormal> Oh, u mean like a smart phone with wireless hotspot capability? [3:22] <abnormal> Matt u still there??? [3:29] <abnormal> orst3n, what's a bot??? [3:37] <armenb> hello....i am looking to buy a 8GB SD card and a reader for my brother who has an rPi. Any recommendations or disrecommendations of what to use or not use? [3:39] <taza> Kingston / Transcend cards seem to corrupt less, but still, backups backups backups. [3:39] <armenb> thanks taza. will do. [3:40] <armenb> taza - any thoughts about microsd cards with the adapter instead of a regular sdcard? [3:41] <orst3n> did u guys read my first posts like ahour ago? [3:41] <orst3n> my32gb class 10 hama sd might be courrupt? [3:42] <taza> orst3n: Does it boot? [3:42] <orst3n> but something seems wrong with it..
[3:43] <taza> Got many things connected via usb? [3:43] <taza> And are you sure you got it formatted right? [3:43] <orst3n> nope just my logitech connector. [3:43] <orst3n> did it with windows and sd card formatter..
[3:43] <taza> Which SD card formatter? [3:44] <taza> Well, the RPi power supply was never meant to be used, so there's that. [3:44] <abnormal> that solved some of my pi problems. [3:45] <abnormal> also I got bigger ones for the powered usb hubs. [3:45] <taza> armenb: You can find the reader I have with just searching Amazon for "transcend memory card reader"
[3:45] <orst3n> is there anythink special i have to take care on formatting ? [3:46] <armenb> heh, that was a half assed question. lemme try again. [3:46] <armenb> is a 16gb card good enough for standard "noob" stuff one might want to do on a rPi? [3:46] <taza> It won't hold too many media files, but other than that it's fine. [3:47] <taza> orst3n: Also, formatting the SD card wrong can frequently cause extreme slowdown. [3:48] <orst3n> dont wanna try it with my working card..
[3:49] <orst3n> abnormal that one works perfect for me too :) i just took out the 32gb class 10 card from hama out of my unused tablet and wanted to try another distrobution..
[3:50] <orst3n> and no smb shares..
[3:51] <taza> I remember the time when everything wasn't DHCP. What a royal pain. [3:52] <armenb> i think 8gb might be better for what my bro is trying to do. [3:58] <The_HunterT> Can't you just put noobs on a card yourself? [4:01] <mantazer> are there any implications of hosting your own web serveR? [4:01] <mantazer> in terms of security of your home network? [4:02] <mantazer> The_HunterT: because of incoming requests? [4:03] <mantazer> :( but realistically they would only know if its getting a lot of traffic right? [4:07] <pksato> mantazer: in most case, is not have problens to hosting a small non comercial site on home connection. [4:07] <pksato> but, some ISP block incoming connection to port 80 and others. [4:08] <pksato> and, need a static ip or dinamic dns service. [4:12] <pksato> but, you can get hosting service for less that $0.50/month. [4:33] <mantazer> The_HunterT: what do you usually do over ssh? [4:41] <The_HunterT> Tunneling, makes my computer's internet think it's at home. Get's me around blocks. [5:12] <mantazer> has anyone here used monkey web serveR? [6:54] <[Saint]> The_HunterT: terribly, terribly offtopic - but, M7 or M8? [6:54] <[Saint]> Both Verizon HTC One variants are rooted - ask Google about it. [6:57] <[Saint]> The_HunterT: Ohhh, you have the M7? [7:00] <[Saint]> M8 is temp rooted, just waiting on S-Off. [7:02] <[Saint]> I can't confirm it, as I don't have the hardware, but the Internets tells me that Weaksauce and Firewater are expected to work on the M7 also. [7:03] <[Saint]> Just hope you never have to repair it. [7:04] <[Saint]> HTC made an outstanding job of botching up the interior of this device. It looks like the entire thing was taped and glued together. [7:07] <[Saint]> Its hilariously bad. [7:07] <[Saint]> If it breaks? [7:07] <[Saint]> Throw it away. [7:07] <[Saint]> The_HunterT: this was using which method to acquire root? [7:08] <[Saint]> I love the copper tape *everywhere*. [7:09] <[Saint]> "lets just put 7 layers of tape on these delicate ZIF cables shall we? Yeah. that'll be fine..."
[7:13] <[Saint]> It definitely does for the M8 - M7, no idea. [7:14] <[Saint]> The latest update does state it "adds compatibility with older models". [7:14] <[Saint]> No idea what that really means, though. [7:15] <[Saint]> Ohhhh - yeah, right. Uuugh. [7:16] <[Saint]> The middle US is really kinda boned in this regard. [7:16] <[Saint]> Want good coverage? Hahaha..no handsets for you. [7:17] <SirLagz> damn. some people are condescending. [7:18] <SirLagz> anyways. that was my vent. [7:18] <The_HunterT> [Saint]: I think weaksauce worked! [7:22] <The_HunterT> how should I name you? [10:02] <shiftplusone> what does ps aux | grep 8057 say? [10:03] <shiftplusone> nope, not what I was looking for. [10:04] <shiftplusone> hm, no idea. [10:08] <shiftplusone> does google say anything interesting? [10:11] <shiftplusone> a bit out there, but do you have enough free RAM when it happens? [10:12] <Justin__m> but how can i check that? [10:13] <shiftplusone> use pastebin when it's more than a few lines. [11:57] <SKyd3R> Does anyone used this poject: http://www.raspberrypi.org/forums/viewtopic.php?t=19686 ? [11:59] <djura-san> Is there any info about how is android on rpi progressing now that the drivers are open? [12:01] <[Saint]> "crickets chirping" is also an acceptable response I guess. [12:03] <[Saint]> It wouldn't have been so bad if Broadcom didn't demo a HW accelerated ICS build like...2 years ago? [12:03] <[Saint]> And then it turned into vaporware. [12:04] <djura-san> [Saint]: maybe they will release it at some point. I see no reason to buy any other android device when i can have RPi however, the waiting is the hard part. [12:05] <djura-san> [Saint]: i have faith that something good should come aout of new drivers. Not sure what is the pregress since i dont follow a lot but time should be our friend in that case. [12:06] <[Saint]> The razdroid(sp?) guys have on their site (paraphrased): "News: There is no news". [12:08] <djura-san> I'm aware of alternatives but i dont wanna use them now. I will wait for news on rpi and android porting. [12:09] <[Saint]> The raspi is quite limited by the SoC, 4.4. * is likely the last branch it will be capable of running, if it ever runs it in the first place. [12:09] <djura-san> everything above 2.3.7 is fine. [12:10] <[Saint]> In KLP with the switch to ART fulltime and the removal of dalvik, ARMv6 will be unsupported. [12:11] <elspru> is there a way to log into SSH with the lite version of NOOBS? [12:11] <elspru> maybe I can edit the noobs.conf or something? [12:15] <elspru> is there any documentation for noobs.conf? [14:15] <ant_thomas> Does anyone know if the follow is possible. I've used IR leds for transmitting IR signals with the RPi for a while, and a project I have in mind might need this function. What I would rather do is rather than transmit using a transistor and an IR led I would rather remove the receiver on the device, get rid of the IR led and wire it directly. Is this idea even technically feasible? [14:17] <pksato> ant_thomas: yes, search for lirc for hardware examples. or even ir control remote control. [14:18] <rigid> ant_thomas: sure. just check signals on the transmitter and the receiver, ensure it's not inverted and connect it. [14:22] <ant_thomas> Thanks. I guess there's only one way to find out! [14:59] <mogurakun> hi... could some owner of rpi install cmake (plus gcc/g++/make) and give me an output of "cmake --system-information" please.. thanks..
[16:00] <neredsenvy> What is the best programming language to use for playing with RPi GPIO ? I have lots of nano electronics sensors, RF modules etc.. Would like to try them out. [16:01] <neredsenvy> I used STM32F4 Board before where I used C and some Assembly but the STM community is almost extinct, not that many resources related to it and even less libraries. [16:02] <gordonDrogon> neredsenvy, the best programming language is the one your most familiar with. [16:04] <gordonDrogon> neredsenvy, well I write/maintain the wiringPi library. [16:05] <m^rk> has there been any discusison of a future revision with wifi onboard? [16:05] <gordonDrogon> m^rk, I think it's unlikely due to the nature of the SoC IO - ie. one USB channel. [16:05] <tero> anyone has it? [16:08] <tero> what does this command actually do? [16:09] <gordonDrogon> git is a source code control system - it lets to manage code. [16:10] <gordonDrogon> that's .. er .. wow. quite an intersting way to install it. [16:10] <gordonDrogon> they ought to be able to make it a lot easier than that. [16:12] <gordonDrogon> I'd whinge at them and see what they say..
[16:13] <tero> fatal: ambiguous argument 'c43739885d512c92c0aa44b5895b96df5141da0': unknown revision or path not in the working tree. [16:44] <gordonDrogon> tero, I can copy & paste from a pdf - use xpdf to view it. [16:44] <gordonDrogon> you ought to be able to c&p that. [16:44] <gordonDrogon> you're after me? [16:45] <CharlieBra7o> Did you read what I've posted 30 mins ago? [16:45] <gordonDrogon> can't see anything in the scroll-back..
[16:47] <gordonDrogon> I've never seen it - and I've done some fairly big transfers over SPI. [16:47] <gordonDrogon> as well as use it to record & playback audio via some cheap DAC/ADC's. [16:47] <CharlieBra7o> hav u worked with a MSP430 yet by any chance? [16:48] <gordonDrogon> it doesn't ring any bells. [16:48] <gordonDrogon> ah, it's a microcontroller. [16:49] <gordonDrogon> never used it. [16:52] <gordonDrogon> my SPI library is just a few simple wrappers round the kernel's SPI driver. You might want to try bypassing my code and use the kernel directly, however I really don't see how my code can do weird bit-shifting like that - it just calls the kernel. [16:54] <gordonDrogon> it's under a dozen lines of code..
[16:55] <gordonDrogon> what is the error message. [16:57] <gordonDrogon> well thats code for the msp430. I'm really not in a position to help you with that. I can only help with the Pi side. [16:57] <CharlieBra7o> no its not. "Raspberry Pi Code"
[16:59] <gordonDrogon> so that's not using my code. does it work? [17:04] <xreal> how hot it the CPU allowed to be? [17:05] <IT_Sean> Does it melt the flesh off your finger when you touch it? If not, it's fine. [17:06] <gordonDrogon> CharlieBra7o, maybe get in-touch with the author of that code. I can't really help you with it. [17:07] <xreal> @IT_Sean: it's 100 km away from me. [17:07] <IT_Sean> 51C is fine. [17:08] <IT_Sean> 's still fine. [17:09] <xreal> @IT_Sean: when will it burn? [17:10] <IT_Sean> It will shut down long before any damage occurs. [17:14] <Shardvexz> 80-85, I forget. [17:16] <xreal> Okay, I have to change FS of my USB HDD from NTFS to ext3/4. [17:16] <xreal> Shardvexz: yeah, I've ordered it already. [17:18] <gordonDrogon> just that I can't help you with code that's not mine..
[17:18] <neredsenvy> I can't open wiringPi website keeps timeouting was just wondering does C/WiringPi support I2C, SPI, UART ? Noticed RPI.GPIO does not offer support for these. [17:19] <gordonDrogon> neredsenvy, there are 'helpers' for I2C, SPI and serial. [17:19] <gordonDrogon> neredsenvy, they are just wrappers round the standard linux kernel routines though. [17:19] <gordonDrogon> CharlieBra7o, I think it means that the person who wrote that code is using a different version of gcc. [17:21] <gordonDrogon> just checked some logs etc. too. [17:33] <Shardvexz> neredsenvy, how much does that cost? [17:33] <CharlieBra7o> gordonDrogon: wiringPi uses SPI mode 0 (CPOL = 0 & CPHA = 0), right? [17:33] <orst3n> where can i find the unofficial repo on 4.0.0? [17:36] <mantazer> does anyone have recommendations for a web server on arch? [17:38] <mantazer> neredsenvy: is that what you use on your pi? [17:40] <neredsenvy> Shardvexz: The interfaces on GPIO and the number of GPIO pins with the performance stats makes it super for running large scale home automation. [17:44] <Relsak> So, I've heard powering external HDD from RPi's USB ports is not smart. Should be safe if I give external power source to HDD, right? [17:47] <[Saint]> neredsenvy: No...no, no...it doesn't. [17:47] <[Saint]> At least not on a raspi. [17:48] <[Saint]> USB will top out *way* before. [17:48] <[Saint]> Ah - my mistake. Carry on. [17:48] <[Saint]> In other news - a printer!?! [18:24] <serfma> Unless there's a way to stream videos through desktop and have no use for XBMC? [18:27] <serfma> So with NOOBs it just adds an option to boot into either OS that you choose? [18:30] <serfma> Would it really matter if I purchased a Micro SD card and used an adapter or would it make a difference? [19:44] <subz3r0> so that i can feet a lilttle db with text, statistics, pictures and so on. [19:48] <Tachyon`> it's the year of code. learn. [20:35] <orst3n> mh i bought a pi starter kit with a power connector "specially made for the pi"
[20:35] <orst3n> external usb hub is active as well..
[20:36] <orst3n> only think left i can do is to put my usb keyboard on the usb hub..
[20:54] <serfma_afk> So I installed NOOBS and Raspbian. However when I boot into Raspbian the image is past the border. But, when I installed Raspbian w/o noobs it was fine...any reason for this? [22:39] <Munt> Good evening folks :) Does anyone know how I might get a hold of “148f:7601 Ralink Technology” USB wireless device drivers for the π ? [22:46] <CarlFK> gst-launch-1.0 -v v4l2src ! 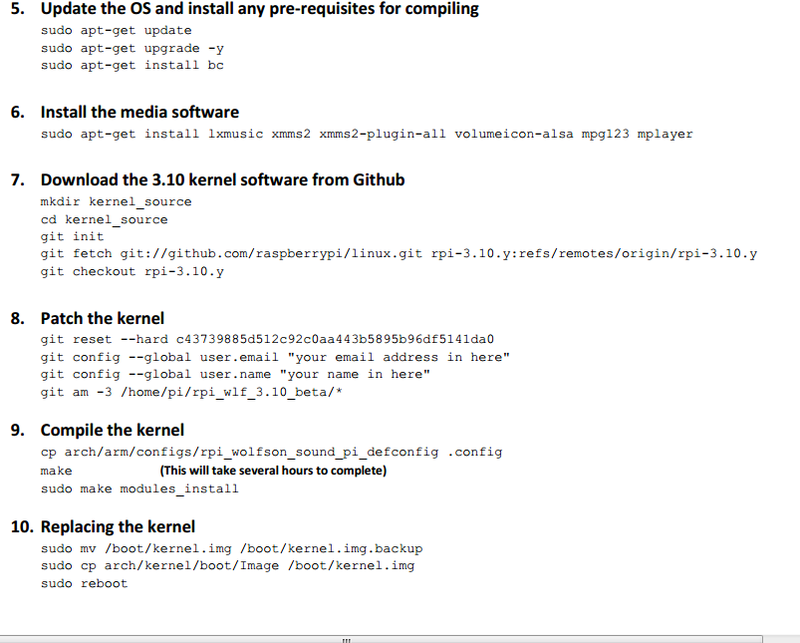 xvimagesink ... "Could not initialise Xv output" - what gstreamer element for viewing will work on the pi? [23:43] <bitplane> Hi folks. Does anyone know of any modems that work with the raspberry pi?